Isn’t he spectacular? I say it’s a he since it seems with his feather that he is showing off a bit this Valentine’s day, looking for his love bird. Toni used our new Bird punch and VersaMarked the scallop edge, bird and branch first before sprinkling with Heat and Stick powder. Then she used the heat gun to melt the powder, which left the card stock sticky to hold all that red and chocolate glitter! Wowza! That red satin ribbon really finishes it off. 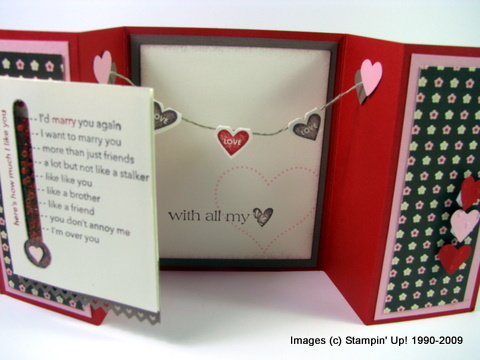 This neat card was stamped by Alanna Wharf. I love all the detail and Alanna, you musta spent hours filling all the thermometers with those tiny beads! Really a great card. This is what you see when the card is opened! 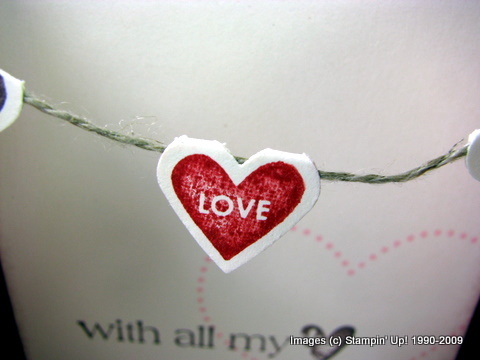 And just a little close up to show you how she punched on the fold line so it created 2 hearts draped over the linen thread line. Sale-A-Bration is officially underway! If you haven’t received your mini catalogs yet, email me! 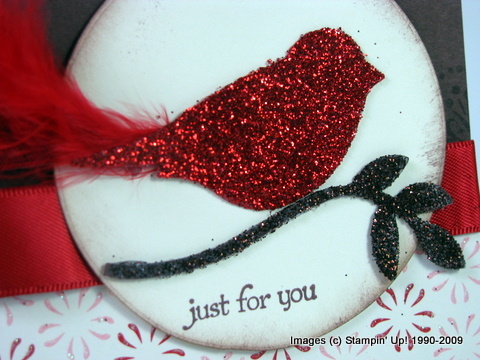 This entry was posted in Swaps & Inspiration and tagged bird punch, glitter, heat and stick powder, rubber stamping ideas, Stampin' Up!. Bookmark the permalink. 3 Responses to Wowza Swaps! I just love the bird punch. This card is really neat. I can see many other cards using this punch for all seasons. 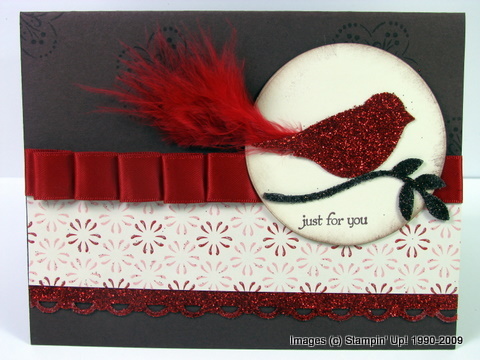 I also LOVE that super sparkly card Toni created, so so fabulous! Alannas’ card is AMAZING I got a chance to see it in person and WOW ! !